The Kugler Alm is located on the western edge of the Perlacher Forst and can be reached by bike through the forest. 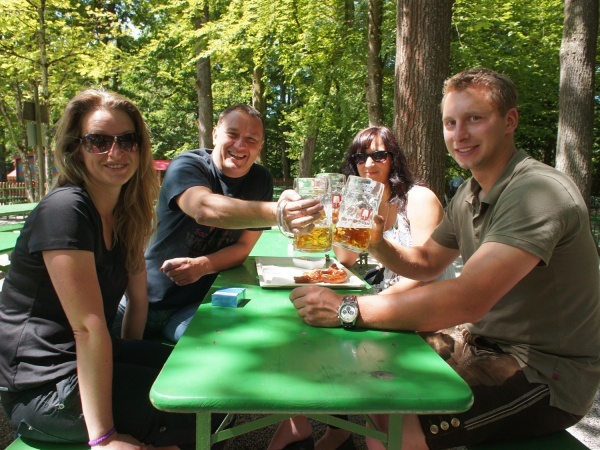 The beer garden is popular amongst bikers coming from Munich. Kugler Alm offers 400 bike parking spaces and even a complimentary bike wheel pumping station. In 1922, the Radler (bicycle beer) was believed to have been invented by the then owner Franz Xaver Kugler, who ran short of beer on a very hot day and diluted the barrels with lemonade. There are 2,400 seats in the self-serviced area. Guests can either sit on traditional beer garden benches under large trees or under a sun and rain protecting shade. A second self-serviced section with regular tables under sun umbrellas is located on a meadow. There are about 200 seats in the serviced area. The food stalls offer a large variety of delicious food, such as typical Bavarian meals, pasta creations and Steckerlfisch (grilled fish on a stick). A special meal offered by the kitchen is Spanferkel (a whole grilled suckling pig) with a crispy crust. The Maß Radler or Spaten Hell (lager) costs €7.40 (April 2016). The Weißbier is Franziskaner. On a regular basis, various bands perform live on a stage in the beer garden. Major football tournaments are shown live on a public viewing screen. The new playground in style of a small farm entertains kids throughout the stay. The beer garden is open daily depending on the weather from 10am to 10.30pm. The restaurant is closed on Mondays. This page was last modified on 18 May 2018, at 18:44.